IVVR(IV2R) systems are designed to improve the customer experience by streamlining calls, and reduce costs associated with human agents and large call volumes. A typical IV2R system configuration is illustrated in the diagram. In such a system, a PC server architecture with a TDM card is used. 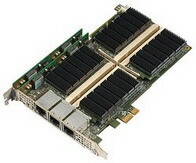 The SurfExpress/PCIe card handles the media processing and an IV2R application runs on the host processor. In such a system, a single PC server with a SurfExpress/PCIe board can support over 1000 voice-only channels or over 220 video-transcoding channels.